Outside of its cities, the Mid-Atlantic can be described as an overwhelmingly green place. It's the kind of landscape in which a Southwesterner can feel lost, because it's often difficult to see far into the horizon in any direction. If you love the Mid-Atlantic, you revel in its verdant landscape. However, if you aren't reveling in the predictable planting choices you see in neighbor's yards, it may be time to expand your horizons by exploring the Salvia genus. It contains far more than Southwestern sages. Before considering Salvias right for Mid-Atlantic gardens, it helps to explore the region's somewhat vague boundaries. The Environmental Protection Agency includes all of New York State in its map of the region, which skirts the northeast all the way south to Connecticut and Rhode Island. It stretches from New Jersey south to the bottom of Virginia and westward through West Virginia. 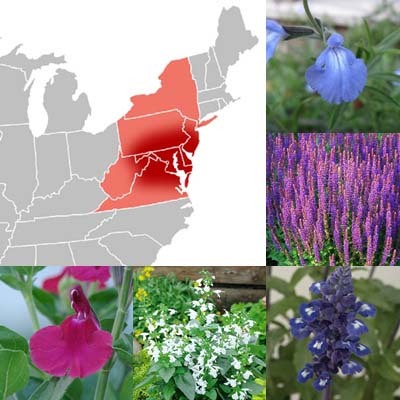 Here's a compromise: In this article, we'll talk about Salvias for New York, New Jersey, Pennsylvania, Delaware and Maryland as well as the portion of Northern Virginia containing Washington, D.C.
Another set of boundaries to consider is in the interactive USDA Plant Hardiness Zone Map. It can help you select Salvias and companion plants appropriate for your part of the Mid-Atlantic based on average minimum winter temperatures. The Mid-Atlantic boundaries we've set stretch from zone 3 (-40 degrees F) to 7 (0 degrees F). Although a perennial or shrub with roots that handle frigid Zone 3 temperatures can also survive Zone 7 winters, the reverse isn't true. For a complete explanation of the role zones play in plant selection, please read Getting Started: USDA Plant Hardiness Zones. In areas with extremely cold winters -- such as the far northern reaches of New York -- most Salvias are grown as long-blooming annuals. They are top choices of wildlife gardeners who want to provide excellent nutrition for bees, butterflies and hummingbirds. Water -- what's too little, just right or too much for the Salvias you want to grow -- is another key factor requiring careful analysis in the mostly moist Mid-Atlantic. The National Drought Mitigation Center in Lincoln, Nebraska, tracks changes in drought conditions throughout the nation weekly. Of course, severe water shortages are a beast of the Southwest and Coastal West. But the Center's U.S. Drought Monitor Map shows a wide range of drought conditions throughout the nation. The Center's drought classification system uses yellow to indicate the least severe level of drought, which it describes as "abnormally dry" conditions based on historic norms for an area. Many Salvias and companion plants are described as being drought tolerant. Yet what may seem abnormally dry for azaleas may seem plentiful to many Salvias adaptable to varying levels of moisture. The phrase "drought tolerant" mostly indicates an ability to get by on less water than a plant might normally expect. Despite the overall high numbers for inches of rainfall in the Mid-Atlantic, some areas can go for weeks or perhaps months with little rainfall. So if you live in an area going through a dry spell, you may want to try Salvias that are adaptable to varying amounts of moisture. In our online catalog, most of these species are characterized as appreciating average watering. In the Mid-Atlantic that mostly means no supplemental watering is necessary; local rainfall generally is sufficient. However, in areas where rainfall is a frequent occurrence and humidity is high, you may want to choose moisture-loving Salvias. We're not going to mislead you about what will grow in a moist region. Certain desert or dry chaparral Salvia species are so easy to overwater that they can't survive an East Coast climate. Yet many Salvias grow well in the Mid-Atlantic, including the Zone 5 American natives Prairie Sage (S. azurea) and Lyreleaf Sage (S. lyrata). Some species native to Texas also make repeat performances after cold winters, including Autumn Sage (S. greggii) varieties for Zone 6, such as the hot pink Wild Thing and Furman's Red. A Zone 8 Texas native, Mealy Cup Sage (S. farinacea), is a popular annual throughout the Mid-Atlantic. It's represented by a variety of cultivars at Pennsylvania's Longwood Gardens (Zone 6), including Henry Deulberg. Many of Longwood's annual Salvias are varieties of Tropical Sage (S. coccinea), such as Forest Fire. Scarlet Sage (S. splendens), which is an annual throughout the nation, is another favorite choice at Longwood. You can find it in the Rutgers University Gardens as well, including Sao Borja, one of the tallest Scarlet Sage hybrids. Cold- and heat-tolerant Meadow Sages are also a good choice for the region. You'll find them naturalized in New York's Battery Park Remembrance Gardens. Longwood grows a variety, including S. pratensis, S. nemorosa and S. x sylvestris hybrids. You can also see the Zone 7 choices Ground Ivy Sage (S. glechimifolia) and Mulberry Jam Roseleaf Sage (S. x 'Mulberry Jam') at Longwood. Sometimes plants classified for a zone slightly warmer than your own local climate may survive to bloom again. In addition to Longwood and Rutgers, a New Jersey public garden containing many Salvias is the Nectar Gardens at Palmyra Cove in Burlington County along the Delaware River. Some parts of the Mid-Atlantic have hydric soils, which release moisture ever so slowly. Salvias, as we say all the time, like well-drained soil. If you want to plant Salvias in the damp northern counties of Virginia, it's a good idea to increase drainage by constructing raised flowerbeds. Similar to so many of the Southeastern states, we know that Virginia loves Tropical Sage. But here's another suggestion: Considering its name, Bog Sage (S. uliginosa) is a fine choice for damp soils. It's perennial to Zone 6. Whichever part of the Mid-Atlantic you call home, Flowers by the Sea has beautiful, long flowering Salvias that are right for your garden. Please call or email us. We have your favorites, but we're also glad to help you expand your horizons.